Liberatory means for liberatory ends. To find out more about Transformative Justice goals, principals, and application, please see Transformative Justice Handbook (PDF). generationFIVE has spent the last decade, with allies across movements and across the country, developing Transformative Justice. 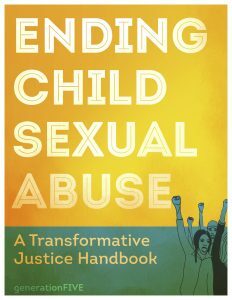 Transformative Justice is an approach to respond to and prevent child sexual abuse and other forms of violence that puts transformation and liberation at the heart of the change. It is an approach the looks at the individual and community experiences as well as the social conditions, and looks to integrate both personal and social transformation. Through this we developed Transformative Justice. We are excited by the exploration and experimentation with similar approaches that we, along with others are engaging in, as we learn to apply the principles and practices of Transformative Justice. How do we build our personal and collective capacity to respond to trauma and support accountability in a transformative way? As of January 2013, there are Transformative Justice Collaboratives in New York, the Challenging Male Supremacy Project, and the San Francisco Bay Area, the Bay Area Transformative Justice Collective.